The most popular tourist destination in Vietnam is the UNESCO World Heritage site of Halong Bay, with it’s impressive limestone karsts and islands rising out of the sea. Imagine gently sailing on a traditional junk boat past thousands of these looming limestone giants, kayaking to magnificent caves with impressive stalactites and stalagmites and jumping from high off the boats into the dazzling warm water. It was a must see for us! 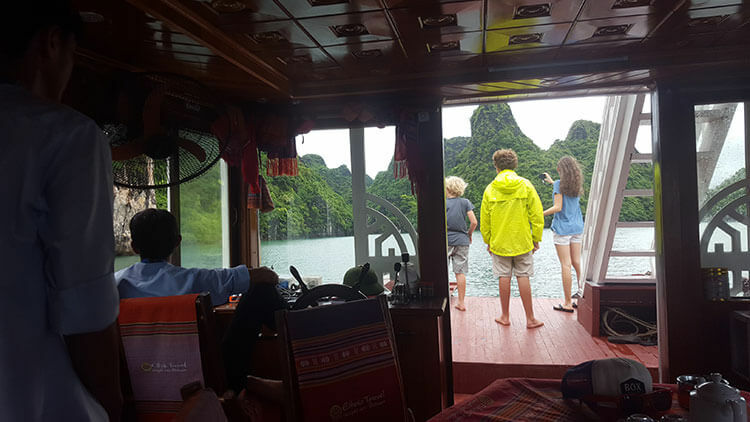 Seeing the vast number of tour companies operating in Halong Bay and with more than 6 million visitors per year, we soon realised we would be hard pressed to avoid the thousands of tourist boats plying the waters of the Halong Bay. 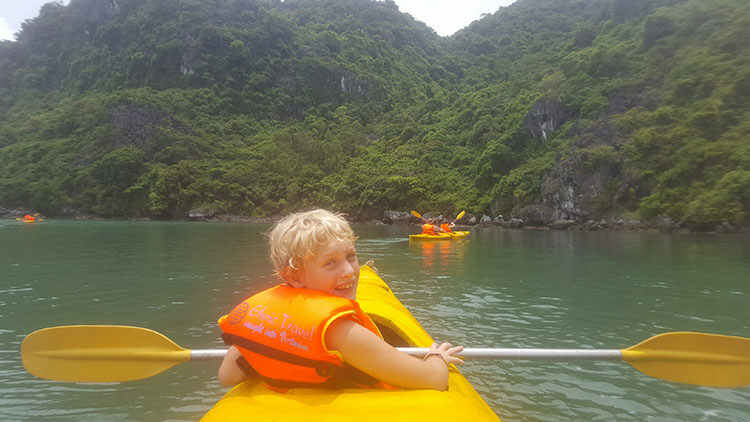 We like to think of ourselves as intrepid travellers and as such prefer the off-the-beaten track options, so after much research, we decided on a tour to Bai Tu Long Bay instead. 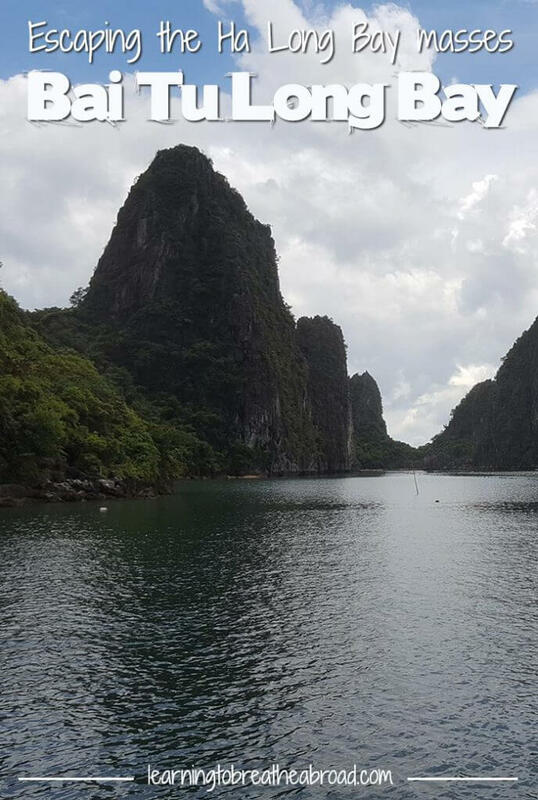 Bai Tu Long Bay covers three-quarters of the Ha Long Bay area and although less known, it’s attractions did not disappoint. 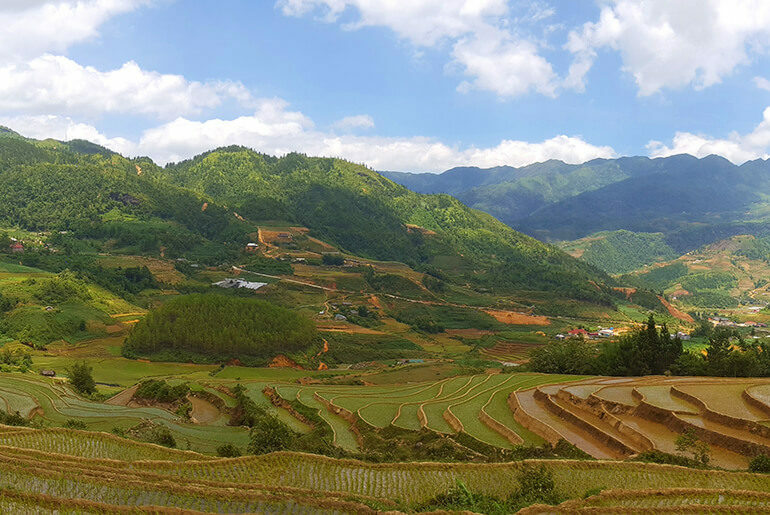 From towering limestone pillars to sandy beaches, picturesque villages, floating fish farms and hardly another tourist in sight, Bai Tu Long is absolutely not to be missed! The fantastic beauty of the bay has given rise to many legends, some of them dating back to the ancient past. It is said that a dragon descended into the deep water, spitting out gems as he did so. And thus the rocky islands were formed. 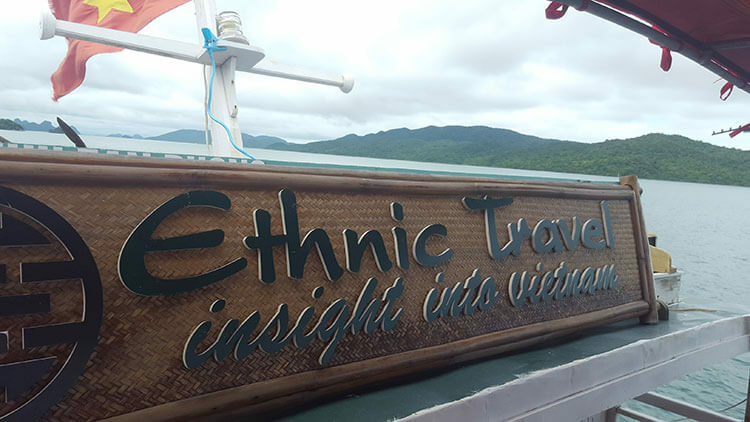 We signed up for a 2-day tour with Ethnic Travel, who I can highly recommend. We were collected early in the morning by the minivan for the 4-hour drive to Bai Tu Long Bay, where we boarded the boat with our 8 fellow travellers. The rain was pouring down as we got aboard but thankfully started lifting as we gently sailed through the mesmerizing bay. Lunch was a veritable feast! The table was groaning with a myriad of delectable choices of vegetable spring rolls, deep fried yam balls, whole steamed red snapper, grilled squid salad, morning glory in oyster sauce, stir-fried chicken and bowls of steamed rice. Fully sated, we lazed in deck chairs on the upper deck, watching the limestone karsts go by. 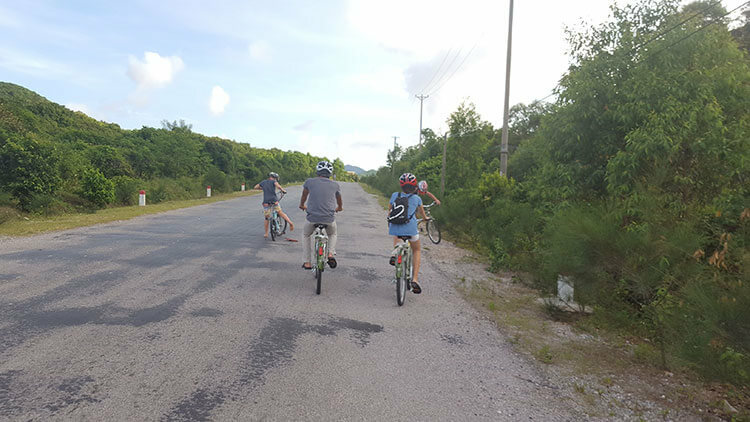 Our afternoon stop was Quan Lan Island, where we hopped on bicycles for a slow ride down the island. We chuckled at the enforcement of riding helmets on a flat island without another vehicle in sight, but rules are rules, so we obeyed! 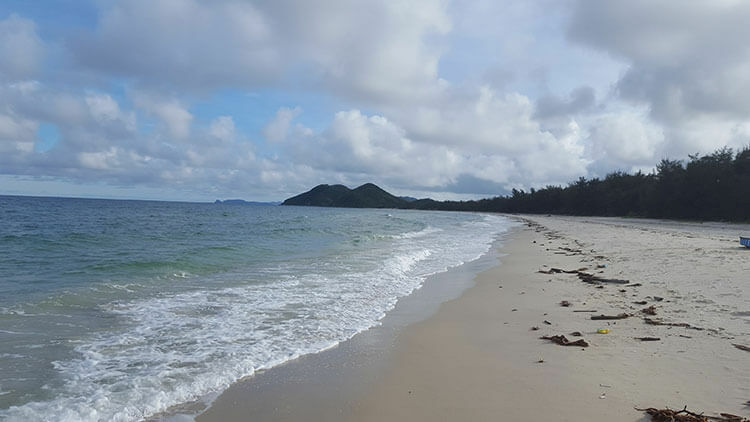 After 20 minutes, we stopped for a much-needed swim at the East Coast beach of Quan Lan. 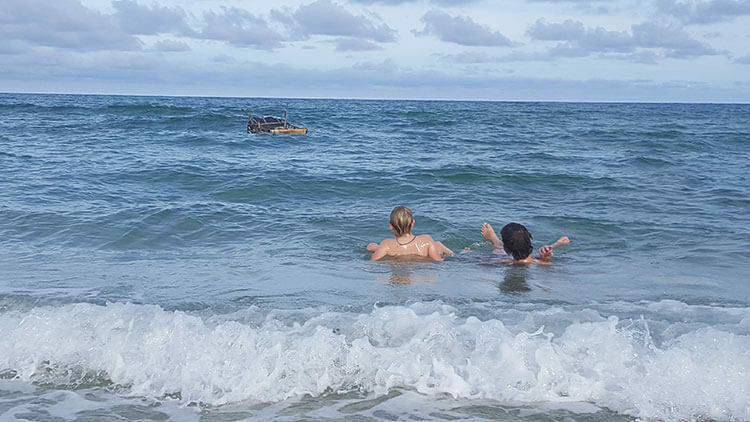 A beautiful long stretch of beach that is sadly is becoming a recipient of rubbish from the South China Sea – not that it put us off – we dived straight in and frolicked in the waves in the incredibly warm water. 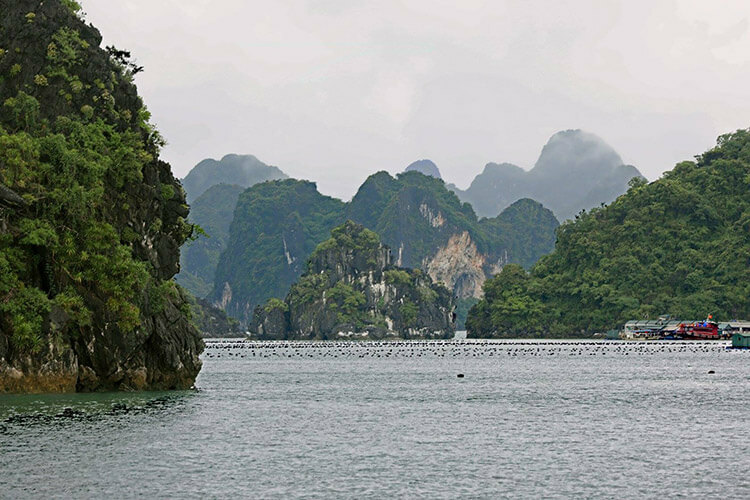 The scenic ride took us past farmlands of rice paddies and chickens, past traditional Vietnamese cemeteries with elaborate pagoda style headstones and alongside the shore with views stretching across to the thousands of limestone karsts dotted throughout Halong Bay. 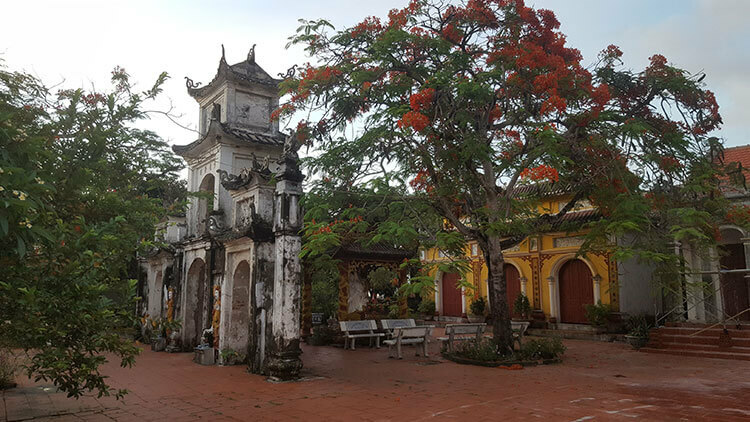 A further 30min ride and we arrived at the picturesque village of, you guessed it, Quan Lan, where we were staying in a homestay for the night. 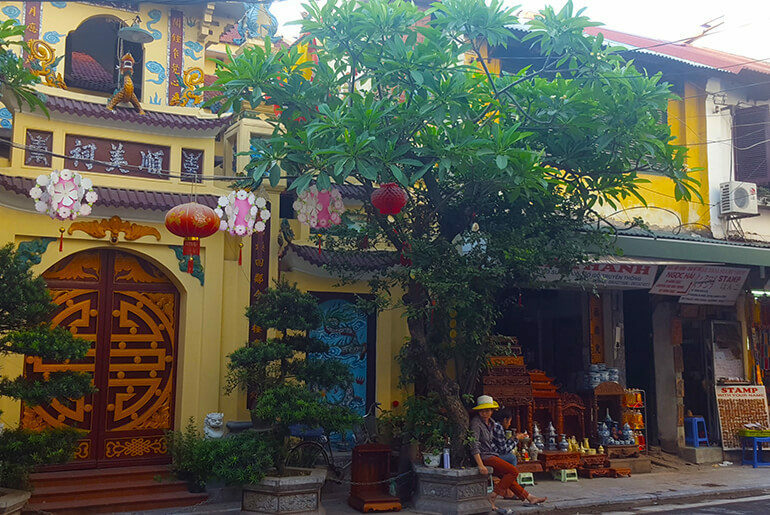 We had the option of helping to make spring rolls for supper but chose instead to wander the streets of the quaint village, watching the villagers go about their business and savouring the slow speed of life here. Questioning what fruit was in a plastic jar, led to us sipping on a homebrew designed to put hairs on our chest! The homestay rooms were clean and spacious with mosquito nets, fans, aircons and en-suite bathrooms. The family was incredibly hospitable and friendly and they sure didn’t let us go hungry with dinner consisting of plates piled high with spring rolls, prawns, stir-fried vegetables, steamed rice, watermelon and sweet little bananas. Day two started with a 3-minute tuk-tuk ride to the nearby jetty and a few hours watching this incredible world go by from the boat. 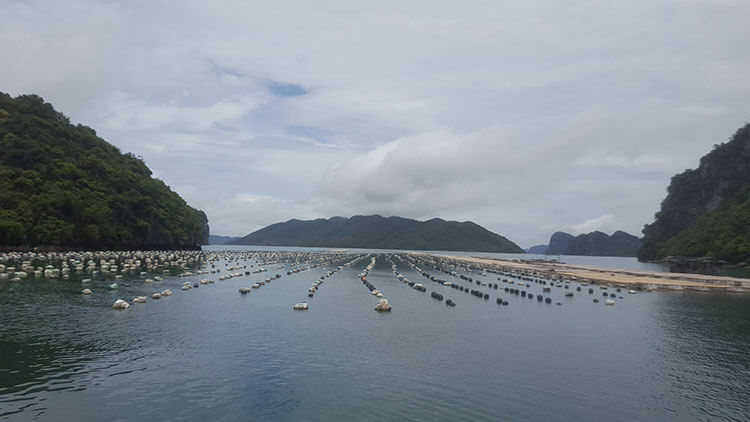 Little fish farms dot the bays, each one with a permanent floating family home. We anchored at one of these, grabbed the kayaks stored here and went for a very pleasant paddle around the bay, getting right up close to the karsts. Obviously, we couldn’t pass up the opportunity to jump into the water from the very top of the boat! What fun! But soon enough we were called back on board as it was time for lunch and to get going again. We arrived back in the main harbour just after 1 pm, jumped into the minivan and arrived back in Hanoi at about 6 pm. All in all an unforgettable experience and highly recommended! 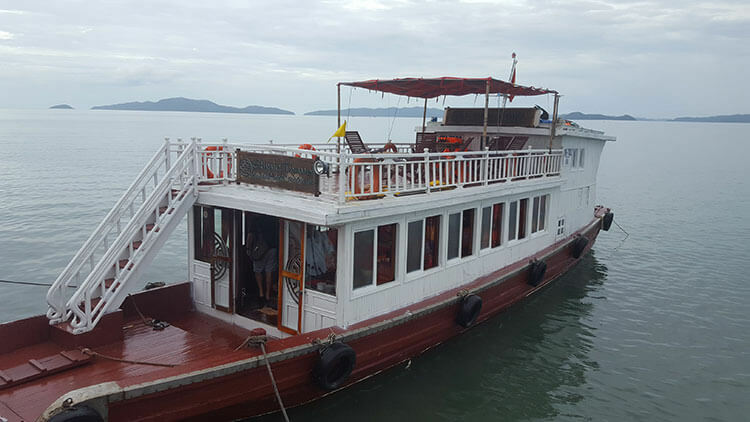 Sadly, we found our research regarding Halong Bay to be full of warnings about tour companies rip-off’s, unsafe boats and reports of Halong Bay teaming with other tourists and boats. With an annual 20 million visitors to nearby Hanoi, you can just imagine the volume of visitors to Halong Bay! I do believe there are many reputable companies offering great experiences, so the advice here is to really do your homework when opting for a tour. The most important point to note is that you get what you pay for so, if your budget allows for it, choose a slightly more expensive tour… you won’t be disappointed.